Here I’ll attempt to explain to non-believers the absurdity of the current headbite mechanic. Thanks to DRM , PRO(! )prietary games mostly have PRO(! )per collision detection, with which it’s obvious where you need to aim to hit the head and it also makes the head difficult to hit for an actual good reason, which is its smaller size relative to the torso. 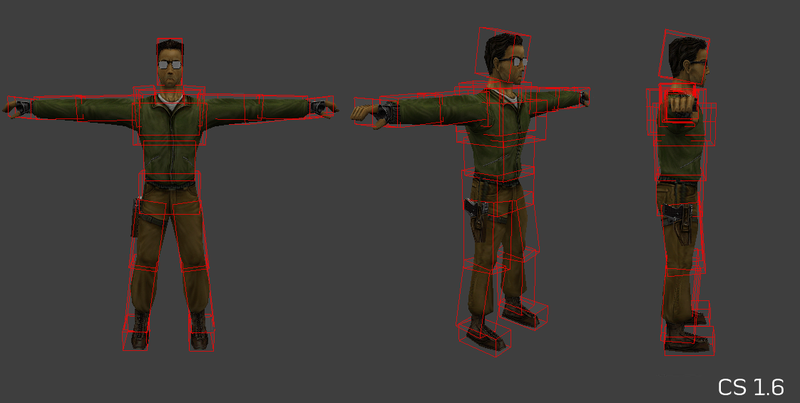 Tremulous models players as boxes, so to hit the head you simply have to keep your cursor at the right level. This way, the head shot mechanic affects small and medium aliens the most, due to the disorientation caused by the need to look very high up, and the broken attack height detection, while dragoons and tyrants are much less affected. Small and medium aliens can’t reach the head directly, so they would have to either jump, stand up or climb the human (of which Tremulous provides only jumping). This makes the very existence of floor head bite non-obvious to some beginners (and GrangerHub needs to keep as many beginners as possible if it ever wants to revive Tremulous). Throwing off head shots by jumping is hindered by limited stamina, while crouching makes you very slow. Because of this, aliens mostly only need to aim horizontally, in which direction the “head” part of the hitbox is the same size as the “body” part. Here’s how I want to fix this: the idea behind the patch I’m writing is to abandon the vertical direction as the main means of adding difficulty to aiming and instead switch the the horizontal direction for that. The new hit detection logic calculates how far did the hit miss the central vertical axis of the target’s hitbox and scales the damage based on that. Grazing hits deal less damage than direct hits. Dretches and marauders still get bonuses for attacking from above, but the bonuses aren’t nearly as huge and the aliens have to be physically above the humans to receive the said bonuses. This also should make the behaviour of knowledgeable players visibly different, hopefully providing new players with some kind of a clue as to what’s happening. Note that some kind of feedback for grazing hits is still needed, but even without it this mechanic should screw beginners over much less than the original one.